Soft by Ryan Werner. Passenger Side Books, July 2015. 86 pages. $10.00, paper. There’s not much to writing rock and roll music. A popular quote says all you need is three chords and the truth. Researching this quote, I learned that it was about country music (from Harlan Howard), but it applies to rock and roll, too. In fact, Lou Reed said one chord was fine, and two was pushing it. (Three, he said, was jazz.) However, there’s more to writing about rock and roll. 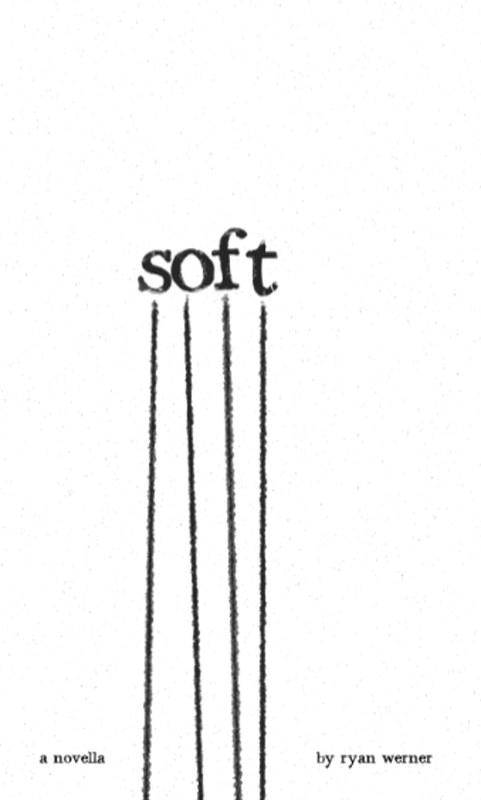 To write about rock and roll, you need 258 microchapters and the truth, as shown by Ryan Werner’s book, Soft, a novella in ten parts, with each part made up of many microchapters, the first part, for example, starting with “chapters 1 through 36.” In eighty-five pages, Werner shows the ups and downs of a rock and roll musician working on his band’s reunion tour, negotiating the differences between his rockstar heyday and the disappointing present. “We’re hardly a band,” I say. Soft shares a title with The Summerbruise’s greatest hits album. The narrator asks Dave about the name of the album, whose wife answers that she thought of it. “Well, there are a lot of ways to take it,” he says. And using one of the book’s many one-liners, Dave says, “I think it’s time you maybe start to worry about ways to leave things.” And while much of Soft has the wit and wordplay of stand-up comedy, with many of the microchapters reading like a comedian’s notecards, Werner’s writing is hard-hitting, too, and wears its heart on its sleeve, as the reader learns, with every joke, that the narrator uses his humor because he doesn’t have much else, his band and his personal life out of his control. “Drum solo!” I yell out in the middle of a song in Las Vegas. Seven-Minute Dave hits the snare once with both sticks in the same hand, and it’s hard to ask for more. And like the title of the microchapter above, there is minimalism in the storytelling throughout Soft, a lack of explicit times and places, such as a postcard being from the town the characters live in, nothing more. The book is not an exhaustive history of The Summerbruise, but more personal, a collection of the guitarist’s thoughts, a document of rarities or odds and ends, like a diary. And so there is more room for laughs and, when the narrator’s life doesn’t go as planned, the lulls, the contemplation where the narrator knows no joke, no guitar feedback, can completely overcome the quiet, the need for something serious. One of the novella’s microchapters is titled “Everyone’s a Critic and Most People Are DJs,” and while I’m not much of either, I can say that Soft shows the successes of the failures in rock and roll’s footnotes, the ones forgotten by the fans, their first and only albums in the uncategorized bins in used CD stores. Werner shows these are the bands worth writing about, strengthened by his fractured form, a “shattered novella” in his own words. There’s not much to writing rock and roll music, but again, writing about it is another story, and here it is. Read the first thirty-six chapters of the novella and a recap of Werner’s Summerbruise book tour from mid-2015, a rock and roll experience in and of itself, on his website, RyanWernerWritesStuff.com. Zachary Kocanda lives in Muncie, Indiana, where he is a master’s student in creative writing at Ball State University. He has also reviewed for Mid-American Review.